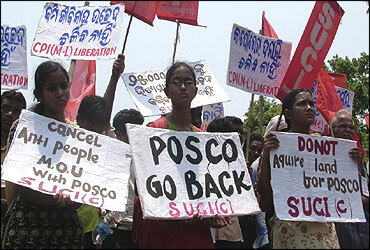 Rediff.com » Business » Will Posco's Orissa project ever see daylight? Will Posco's Orissa project ever see daylight? Exactly six years after Korean steel giant Posco signed an MoU with the Orissa government for a Rs 52,000 crore (Rs 520 billion), 12 million tonnes per annum project, the mega venture remains mired in uncertainty. As the anti-steel plant agitation gains momentum, both Posco and Orissa government have vowed to push ahead with the project in Jagathsinghpur district. The country's biggest single FDI project till date has been beset by stiff protests from local communities against land acquisition. As if that was not enough, POSCO's MoU with the state government is set to lapse. Despite obtaining a green clearance from the environment ministry, the project remains grounded in view of large-scale protests against land acquisition. "We are committed to the Orissa project. 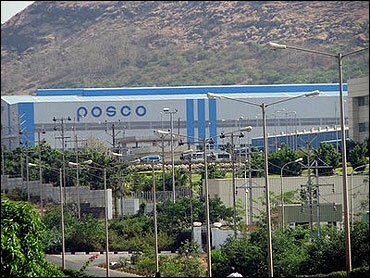 We are hopeful and very optimistic about the plant," Posco India vice-president Vikas Sharan told PTI over the phone. On renewing the MoU, Sharan said, "You have to ask the Orissa government on this matter." Image: Posco site in Orissa. The MoU for the project was inked with the Orissa government in June 22, 2005, but no headway has been made since then. The Pohang-headquartered steel major was to build a 3 million tonnes per annum capacity steel plant during the first phase between 2007 and 2010 and expand the final production volume to 12 million tonnes per annum. The entire project requires 4,004 acres of land. POSCO will now have to sign a fresh MoU and though the Naveen Patnaik government has an investor-friendly image, it remains to be seen how proactive the state government is in the present circumstances when protests are at their peak. "We are very optimistic over the Korean project. A committee is examining the issue of renewing the MoU after the environmental clearance," Orissa Steel and Mines Minister Raghunath Mohanty told PTI. Image: Villagers hold placards during a protest. "Protest is a common phenomenon. Besides, Posco is the biggest single FDI venture in our country. We are always ready to face any kind of pressure for the benefit of local communities as well the state," he maintained. The environment ministry, in May, gave final clearance to the 12 million tonnes per annum plant with certain conditions, including ensuring that tribal rights and forest protection laws are observed. The protests are not going to end any time soon as noted social activists, including Swami Agnivesh and Narmada Bachao Andolan leader Medha Patkar, are now lending their support to the agitators. "What is happening at the proposed project site is completely illegal. The land acquisition should happen only after proper dialogue with the local communities," said Patkar, a veteran of many a protest. Image: Villagers and their children lie at the proposed Posco site during a protest. Accusing the chief minister of adopting a callous attitude toward local community, Patkar asked, "Why can't Naveen come down to Dhinkia for the people while he rushes to Delhi for talks with the South Korean President for the Posco project?" "Why are you using the police to beat up villagers for a foreign company? Is not it illegal to acquire land of farmers without their consent? 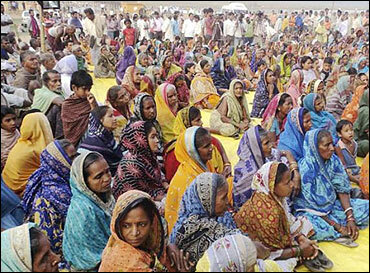 The state government and the Centre have no right to acquire land at gunpoint," Patkar said. Meanwhile, Posco Pratirodh Sangram Samiti (PPSS) Prashant Paikary said, "This battle will continue till our last breath."